Writing about Venice is difficult because everything has already been written hundreds of times. 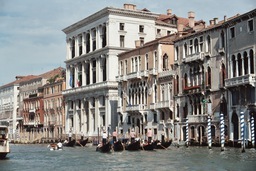 Every canal, church, piazza and palace has been described, usually in superlative. All I can say is that I agree with all these romantics who found the city magical. Venice is everything you expect and more. We visited Venice at the end of May 2003. We were told that 4 days was more than enough time. But in fact it wasn't. We could easily have used a full week to see all the major sights and enjoy the city fully. So my advice will be not to try and "do the city" in one day. Venice is worth as much of your time as any other city in Italy. It is my belief that you can't feel the true magic of the city if you spend only one day or less in Venice. Think about it: there's Piazza San Marco, the Basilica, the Doge's Palace, the Grand Canal, the Bridge of Sighs, the Rialto bridge, the Arsenale, Ca d'Oro, Campanile di San Marco, Accademia, Peggy Guggenheim Museum, the other islands (Murano, Burano, Lido etc. ), and the many beautiful churches, campos, and palazzi. In almost every church or scuola you'll be able to find paintings of great masters, an abundance of Tintoretto, Titian, Veronese and Tiepolo. Also one should take the time to explore the back alleys; spend the afternoons strolling through the quiet parts of Venice, enjoying the architecture, the lovely campos, and the small neighborhood cafes. When we were there Venice was experiencing a heat wave. The sun was merciless and we had to take cover from it from noon to around 6 PM. But Venice is full of little cafes on side streets where you could sit outside and enjoy a cold drink. Despite the heat (or maybe because of it), the city was really beautiful in the late afternoons when the sun would set and the streets were again full with people. One amazing thing about Venice is that are no cars or motorcycles around. This makes walking a lot of fun as you don't have to dodge the traffic (as in Rome).